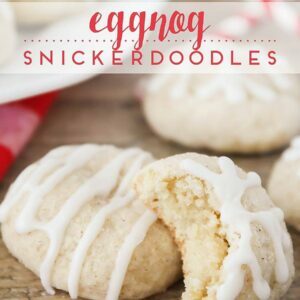 Eggnog Snickerdoodles - made with eggnog and a splash of rum extract in the dough, then rolled in a nutmeg and cinnamon mixture. SO yummy!! Preheat the oven to 350. Line two large baking sheets with parchment or spray with cooking spray. In a large bowl or the bowl of a stand mixer, beat together butter and 1 cup sugar, until light and fluffy. Add the egg, rum extract, and eggnog, and mix to combine. Add the flour, salt, baking soda, and nutmeg, and mix until a soft dough forms. In a small bowl, whisk together the ½ cup sugar, cinnamon, and nutmeg. Scoop the dough into one inch balls and roll in the sugar mixture. Place on the prepared baking sheets. Bake 10-12 minutes, or until lightly browned on the bottom. Let cool on pan for 5 minutes, then move to a cooling rack. While the cookies are cooling, whisk together the powdered sugar and enough eggnog to make an icing that is easy to drizzle but not too runny. Pipe snowflakes onto the cooled cookies, or drizzle with the icing.